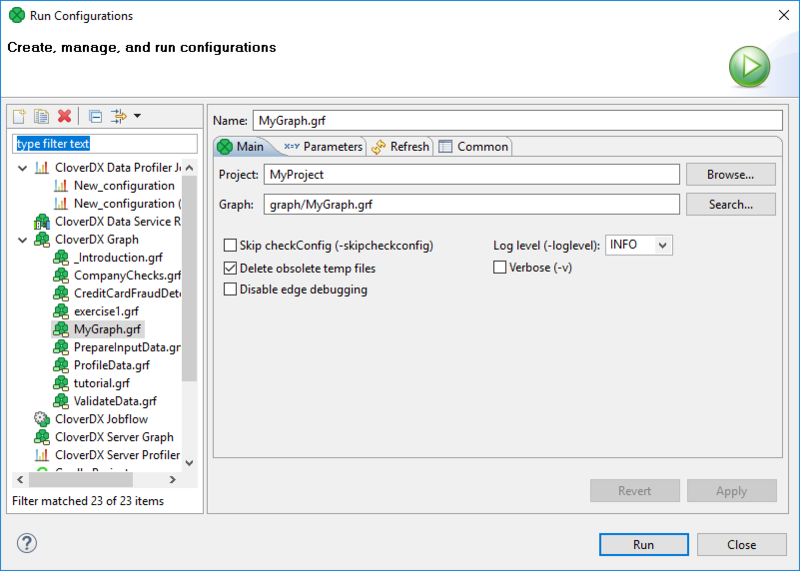 Run Configuration is per graph configuration of an execution of a particular graph. Each graph can have one or more Run Configuration(s). 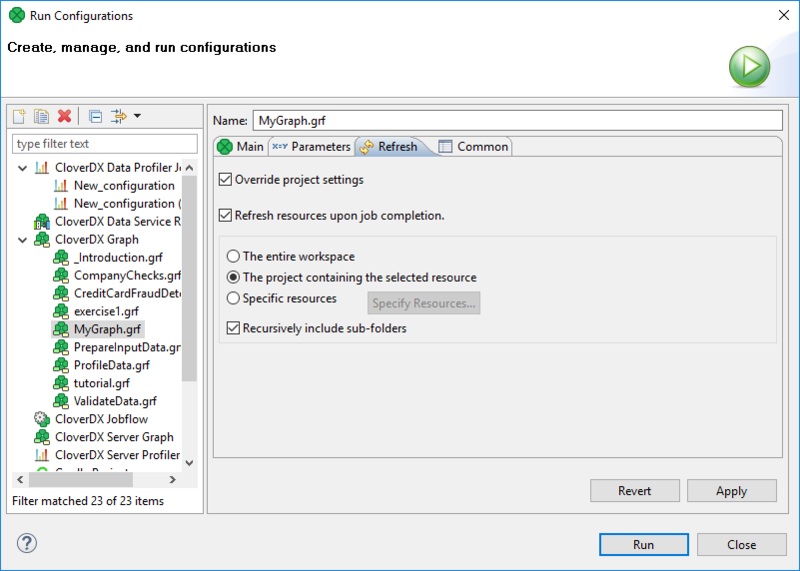 Run configuration is accessible from the main menu Run → Run Configurations. 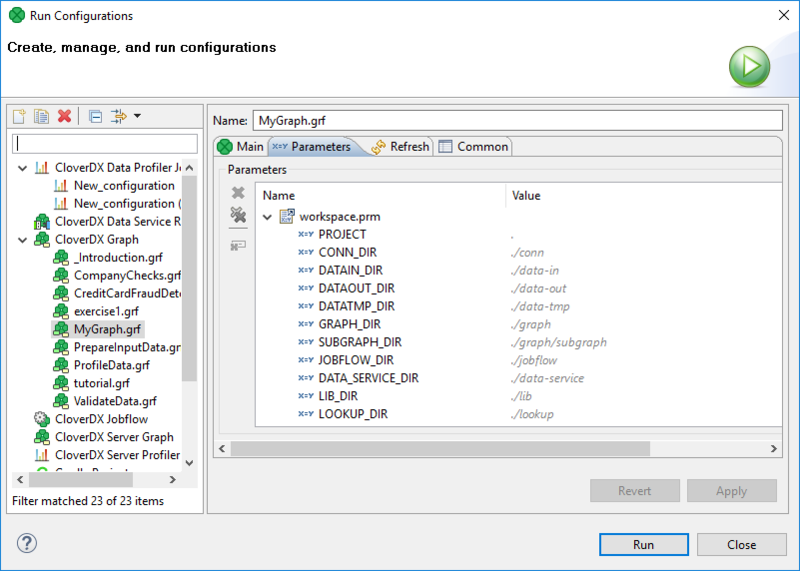 Run configuration is per graph configuration. It can override graph parameters, change the debug level, etc. It cannot change JVM settings or define external libraries to be used. CloverDX Runtime configuration is per workspace configuration. It can change JVM settings (e.g. heap size) or specify external libraries to be used. Since introduction of CloverDX Runtime the majority of graph configuration is done per workspace using Runtime Configuration. See Chapter 14, Runtime Configuration. Select Run Configurations from the context menu and set up the options in the Main tab. Defines one of the following: ALL | TRACE | DEBUG | INFO | WARN | ERROR | FATAL | OFF. Default Log level is INFO for CloverDX Designer, but DEBUG for CloverDX Engine. Skips checking the graph configuration before running the graph. Before your jobflow is executed, tmp files from older jobflow runs on CloverDX Server will be deleted. When you execute a graph/jobflow from Designer, the DEBUG mode is always invoked, which is why the temp files are kept on server. On the Parameters tab, you can override graph parameter values. This lets you run the graph with different parameter values, e.g. for testing purposes. On the Refresh tab, you can specify resources to be refreshed after the execution of the graph. This configuration is per graph. If you need configuration of refresh per project, see Chapter 19, Refresh Operation.